This is a SECURE website that adheres to tight security requirements set forth by Visa, Master Card, American Express & Discover card. Owned and operated by real cowboys and cowgirls. In business since 1992 and Online since 1999. Listed with Dun and Bradstreet. We were there, on-line when no one else was! THE WILD COWBOY® is a western retail store offering quality western products to the United States, Canada, and most International Countries. Every shirt, hat, boot, garment, accessories and child western toys are tested by our company for durability and quality. THE WILD COWBOY® is everywhere ! 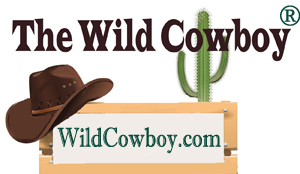 TheWildCowboy® has sold products for many Movies and Television shows and even the President of the United States. Our Western Wear has been worn by celebrities, NFL Cheerleaders, been in Parades, Theatrical plays, Disneyland, Disneyworld & the list goes on! Your information is never sold or given to other parties. The Wild Cowboy carefully selects every product we offer. We do not sale costumes or cheaply made western outfits. All products are first tested by our Wild Cowboy team. All products are kept in a climate controlled NON Smoking building. Our products are NEW, NOT tried on, dropped, kicked, abused, etc. If you have any questions or comments, be sure and call or email us.